Having an email address is crucial for the online invoices system. This is where you will get the latest updates about your invoices and payments and other important emails, so make sure you registered with your email and the email is active. Enter your current password in the “ Your Current Password ” text box. 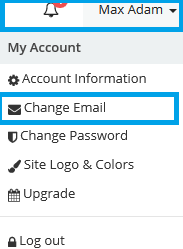 Enter your new email address in the “ New Email Address ” text box. Log out from your system and log in using the new email address. Start using online invoices software now, or try our free invoice maker.